Built to Phil Demmel' no-holds-barred specs, the PDXT String-Through King V is a fearsome new take on the Machine Head guitarist' regal Jackson signature model. 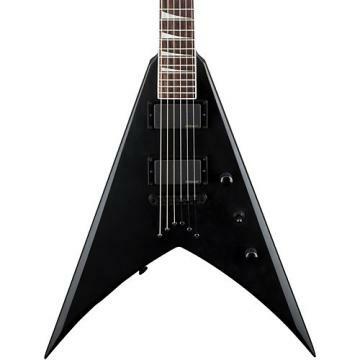 Features include a basswood King V body with cutouts, three-piece through-body maple neck with graphite reinforcements, compound-radius (12-16) bound rosewood fingerboard with 24 jumbo frets and pearloid shark fin inlays, dual EMG HZ humbucking pickups, dual volume controls and three-way blade pickup selector switch, adjustable string-through-body, compensated bridge, and black hardware. Case sold separately. Get the Jackson that's right for you. Order today.